The Wheel of the Year is a fundamental concept in the worship of Our Mother God. The cycles of nature on earth represent both the primal Sacred Drama and a map of the metaphysical cosmos. Here we have a complete diagram of the Wheel of the Year. Please click it for a magnified view. Once you have enlarged the image you can use the Ctrl + and - keys (Windows) or Command + and - (Mac) to resize the Wheel to your exact requirements. As we see, the Déanic year is divided into thirteen twenty-eight-day months and five seasons, one of which is only one month long. The four three-month seasons correspond to the four directions and the four terrestrial elements (water, fire, earth, and air) while the fifth season corresponds to the fifth element (aethyr or akasha) and the vertical direction. At the end of the fifth season/thirteenth month is a one-day (or in leap years two-day) interval which has no date and is not considered part of the year. This is the Hiatus and represents the time when the Holy Daughter of God the Mother was dead. Upon Her resurrection the New Year begins. There are eight High Festivals in the year that come roughly at the two Solstices (Nativity and Rosa Mundi) and the two Equinoxes (Eastre and the Feast of Divine Life), plus the four cross-quarter days that lie between them (the Feast of Lights, the Feast of the Exaltation of the Queen of Heaven, the Festival of Regeneration and the Feast of the Dead). 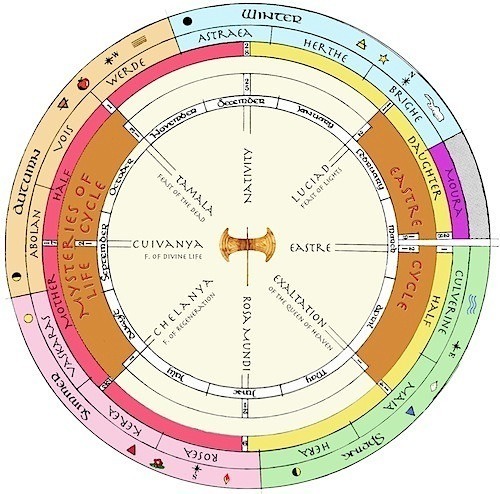 There are also Low feasts in addition to these eight, but as we are here dealing with the fundamental structure of the Wheel of the Year, we stay for the moment with the Great Eight. The Vertical Axis of the Sacred Year is formed by the two solstices, which are known as the Gates of Heaven. These are Nativity at midwinter and the Festival of the Rose of the World (Rosa Mundi) at midsummer. The horizontal arms are formed by the two equinoxes, Eastre in Spring and the Feast of Divine Life (Cuivanya, the Golden Festival) in the fall. The Wheel of the Year is divided vertically into two halves, the Daughter Half, beginning with Nativity, and the Mother Half, beginning with the Festival of the Rose of the World. We may also see another important pattern in the Sacred Year. 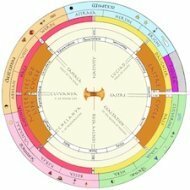 With the solstitial axis as the haft, the remaining festivals form two cycles – the Eastre Cycle and the Mysteries of Life Cycle – which resemble the twin blades of the Moon-Axe or Labrys, one of the most ancient and fundamental symbols of feminine religion. Thus, Nativity falls at the summit of the labrys-haft with the remaining Daughter-half festivals forming the right blade, and Rosa Mundi falls at the base of the labrys-haft, while the remaining Mother-half festivals form the left blade. This Mother-Daughter symmetry is another indication of the equivalence of the labrys or moon-axe to the yin-yang symbolism of the Far East. Another important point about the Déanic year is that in any given year, every month will begin on the same day of the week. Thus each year is ruled by the Janya of the day that begins its months. Among Déanists and Filianists, the Janya ruling the year of one's birth is considered as significant as the ruling animal of one's birth-year in Chinese astrology. In the pages that follow, we shall consider in detail the festivals and months of the Sacred Mother-Year.